Pinterest is a social networking site that acts as a virtual inspiration board. There is a very active community of librarians that post pictures of their library displays, signs, and decor. You must create an account to get the full benefits of the site, including the ability to see every picture and to create your own board. Follow Amy Kline's board Library signage on Pinterest. Follow Cathy Burnsed's board Library signage & book love on Pinterest. Follow Kirsten Murphy's board School - Library Sections on Pinterest. Follow Laura D.'s board School Library Book Displays on Pinterest. Displays can be a very effective tool for building a climate conducive to learning in the library. Many of the merchandising techniques used by bookstores can be equally successful in the library. Librarians can use displays to promote, provoke, support and build a community of learning. The most common use of library displays is to promote new materials or special library programs (“Vote for YOUR favorite mystery.”). These promotional displays can provide a cornerstone for reading motivation programs, library contests, student book clubs, after-school programs, author visits, or themed activities like a poetry slam. Library displays can also provoke students to engage in personal exploration and inquiry. Featuring books on little-known but interesting topics, on areas of high student interest, on current issues, and on curriculum topics may induce students to investigate ideas they would not have thought about otherwise. Library displays can support students and teachers by making the resources forcurriculum units more accessible. A combination of books and real objects may bring a topic to life for students (e.g., samples of rocks, barbed wire, telescope replica). Finally, library displays can reflect and build a community of learning. Student work should be displayed whenever possible and changed frequently. The heritage and background of students and parents in the school community should be honored by special displays. Be creative in finding places to mount displays. Many librarians use the top shelf of wall units for displaying interesting objects and face-out books. The tops of low bookshelves can be used for showing student projects and special book displays.Librarians have also used window sills, tables, slotted walls, and freestanding display units. displayed face out, colorful background or tablecloth). • Change the displays regularly. The mission of school libraries is to build empowered, independent learners. Clear and attractive signage will enable students to use the library both efficiently and effectively. Current awareness (e.g., upcoming special programs, new books). Color – Contrast is the important aspect in choosing colors for background and lettering. Most libraries prefer either a white background with black lettering or a dark background with light lettering. School libraries may use brightly colored signs to add visual interest in the library, but signage should never be obtrusive. The signage colors should be consistent throughout the library. Graphics – Elementary libraries should consider adding visual pictures or symbols to the words on the signs for easy recognition by all students. Size – The signs for locations and directions should be large and easily visible from a distance. The size of other types of signs should depend on their location and use. The relative size of signs communicates a philosophy of service. If the signs designating codes of conduct are larger than the signs about the inquiry process or Dewey Decimal System, that difference in size subtly tells students and teachers that rules are more important than student investigation. Font – The most readable and commonly used font in library signage is upper and lower case Helvetica Medium. Materials – Signs can be printed or engraved on every type of surface from paper to plastic to wood. 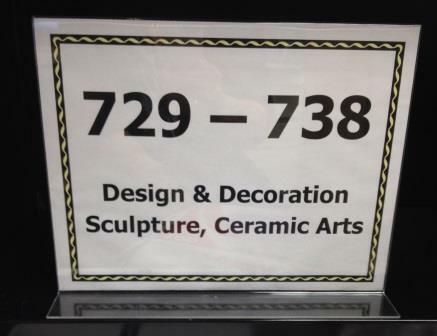 If money can be raised, durable signs should be purchased from library supply vendors. You can also make your own computer-generated or handmade signs that you laminate for durability. You may use Velcro to secure signs to bookcases so they may be moved easily. 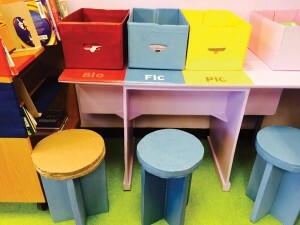 To accommodate students with visual disabilities, signage should have high contrast, a non-glare surface, and raised lettering or Braille on shelf labels. To accommodate students in wheelchairs, signage should be placed at a readable height. If your school has a high Spanish-speaking or other-language population, you may want to consider providing some signage in that language.